National Election Campaigning has resumed after the suspension following the events of the 22nd of May in Manchester. Our latest NowCast includes data from polls with fieldwork after the Manchester Bombing. From our next forecast (1st June) we will move to a true forecast, projecting the result for the 8th of June. We move to a proper forecast with a week to go as by this point the uncertainty in the forward looking element of our projections narrows to a point where we can have greater confidence in the actual outcome. At the moment the confidence interval projecting forward is too wide to make a forecast meaningful. Our NowCast is based on the most recent polling data, where data tables have been issued. 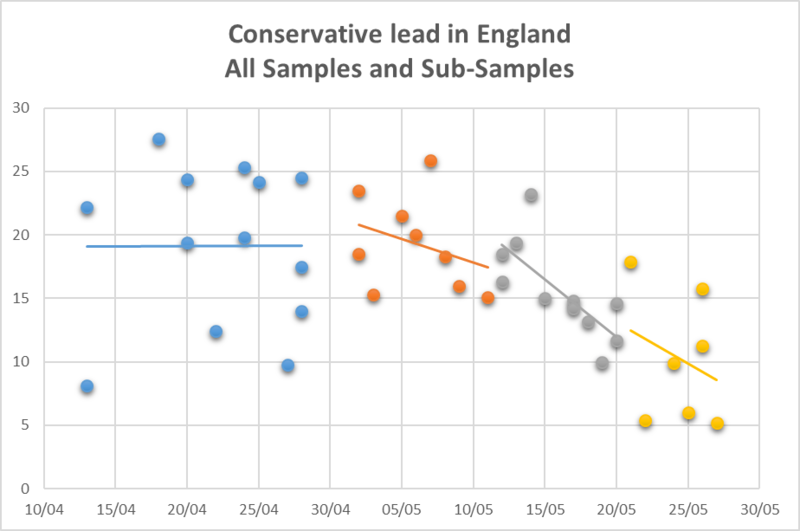 More polling data indicates further uncertainty in England as the Conservative lead over Labour varies significantly depending upon sampling format, turnout weighting and other factors. Although the overall trend in samples and subsamples shows a tightening of the race in the last few days, there is still no sign that the Conservatives will not increase their representation in the Commons, but there is the possibility that Labour might actually gain seats overall. In Scotland and Wales the Conservatives are doing better and we have high confidence that in both locations they will increase their seats, potentially quite significantly. There is increasing evidence that the Unionist vote in Scotland is solidifying behind the Conservatives, and they may make significant gains across the Lowlands and Border regions. For the first time we have a forecast SNP vote share in Scotland below 40%. We see evidence that the Liberal Democrats are being squeezed and may lose seats. Our Northern Ireland forecast has been updated.